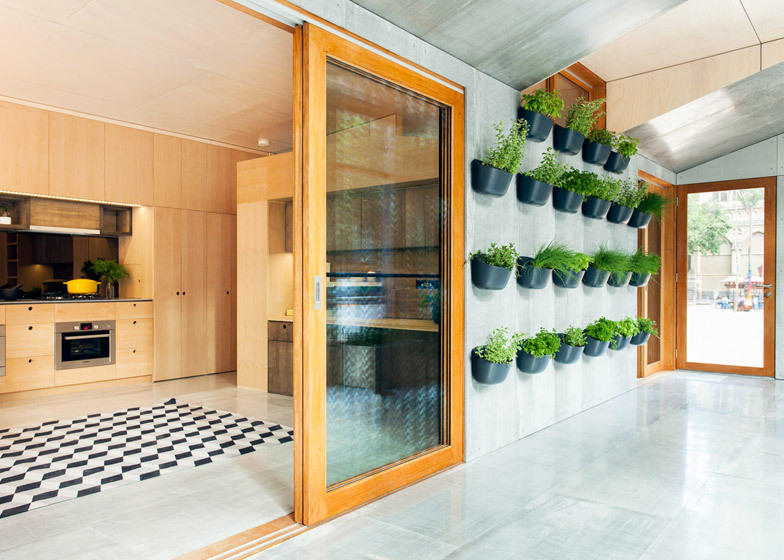 Modular buildings specialist ArchiBlox has unveiled its prototype for a compact carbon-positive house, featuring "edible garden walls", a sunroom and an insulating grass roof (+ slideshow). Described by ArchiBlox as the world's first carbon-positive prefabricated house, the Archi+ Carbon Positive House is designed to produce more energy than its uses – over its lifespan it is expected to offer the same environmental benefits as 6,095 native Australian trees. 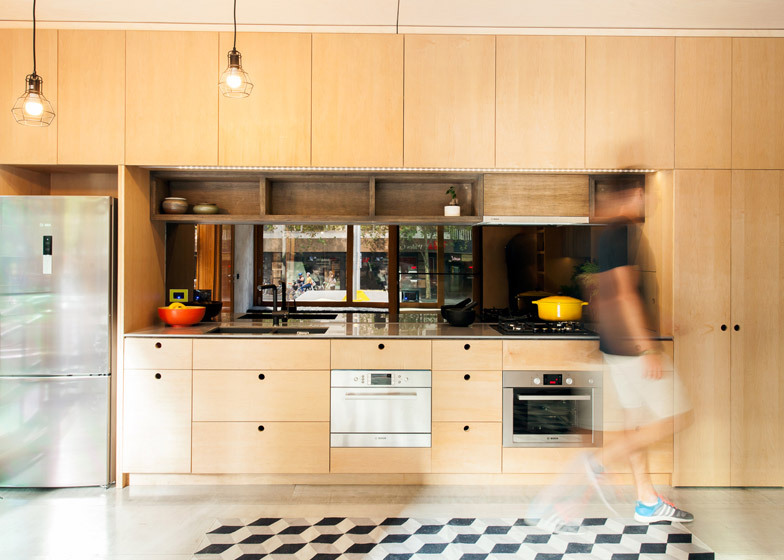 "Archi+ Carbon Positive Houses will make significant contributions within society by addressing the increasing levels of carbon emissions and the high levels of embodied energy that come with the construction of a standard home," said the company. "These homes will give our clients the opportunity to rid themselves of modern day lifelines in a house that has been developed through a collaboration of design sensitivities and new technologies with like-minded companies," the architects said. 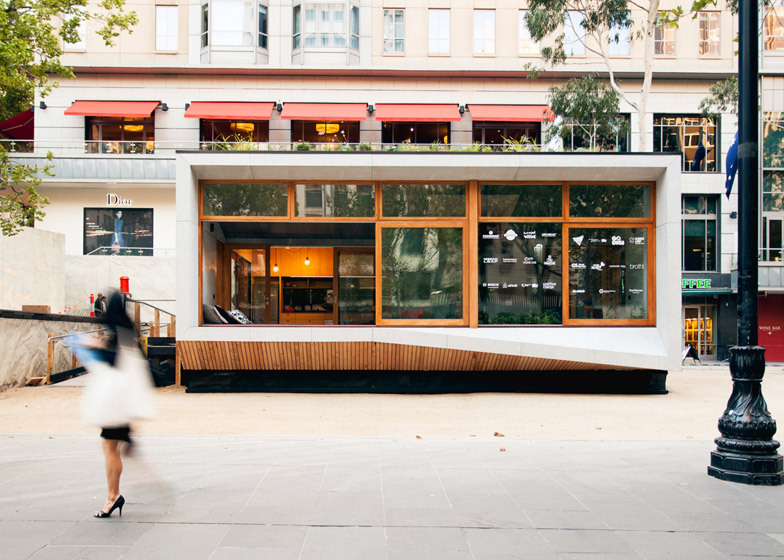 The single-storey prototype has been installed in Melbourne's City Square. Behind its glazed facade, a sunroom spans the width of the building, creating a buffer zone between the exterior and the living spaces. Designed to face north, this room creates a pocket of warm air that will help to insulate the interior during the cold winter months, but will also protect the main living spaces from harsh sunlight in summer. ArchiBlox calls it the "lungs of the house". At the rear of the space, one wall is covered in plant pots that residents can use to grow their own herbs and vegetables. Grassy plants cover the roof of the building, offering a layer of insulation. ArchiBlox also specified the addition of in-ground cool tubes, designed to create cross-flow ventilation by pulling air in from the floor on the south side of the house and emitting it through the north-facing clerestory windows. The living spaces have been organised to be as compact as possible. A combined lounge, dining area and kitchen sit on one side, while a wall of cupboards screens a bedroom with an adjoining bathroom. "Clever uses of joinery and the use of full height openings allows a free flowing space and generous area," said ArchiBlox. 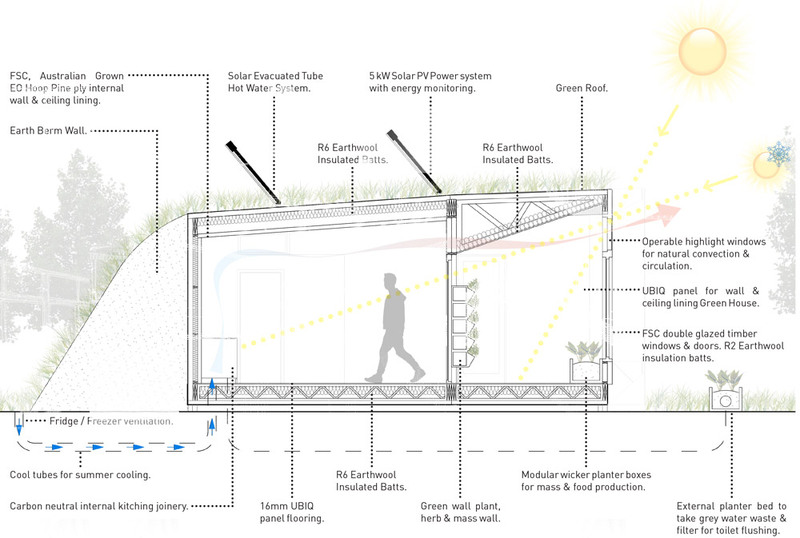 The house has been designed to make use of solar power through a series of roof-mounted photovoltaic panels. Rainwater recycling is also part of the product, helping to reduce water consumption. Photography is by Tom Ross.